Here are two of my grind shows: Freak Animal, and 2- Headed Baby, behind one banner line. In 1971 I was ready to open my first season with grind shows in south Texas. I had my two- headed baby show and a small freak animal show. In the animal show I had a five- legged sheep; two elephant- skinned dogs; a couple of big snakes, and some pickled animals: an eight- legged pig; a two- headed baby calf and some preserved sea animals. Sue Perryman and I opened January 1 in San Juan, Texas with Moore's Greater Shows. We played four spots with Moore then joined 20th Century for Laredo and McAllen. I put up a 5-in-1 sideshow in McAllen as there were a couple of show people who wanted to work. I always carried a few sideshow banners, electric chair and blade box, and I had a trunk full of magic so we were always prepared to do a sideshow no matter what show we were on. After McAllen fair we joined Lee Haywood Shows at Goliad, Texas. With the two grind shows we played eight still dates- none of them amounted to much...the highlight of this tour was when Sue gave birth to our daughter Connie Sue in Bryan, Texas on April 24! Two weeks after Connie's birth we drove up to Oklahoma and visited Sue's folks. We left our big van there with them and took our Ford camper and trailer up to Michigan and joined Skerbeck's Shows in Menominee on May 24. We had two grinds: the animal show and a snake show. We stayed the full season, closing in Norway, Michigan September 6. About halfway thru the route, we closed the snake show, and put the baby show up instead as people up there did not seem to be interested in the snake show.This may have been because the snake show was just a walk- thru with no handler inside. Sue wasn't handling snakes at this time because she now had our daughter to take care of. Business was just fair on this route, but the reason we stayed the whole season was because we had all new tents, banners and equipment, and as we were setting up on the very first day, the show manager saw us, wanted us, and gave us a really great deal for the whole route. We left Michigan, picked up our truck in Oklahoma, and joined Bill Haymes' Show in Abilene, Texas. We booked for the remainder of the season, but on the way to Amarillo, I had an appendix attack, and was in the hospital for three days. Believe it or not, the show cancelled us out! This was the only time in my whole life, even up thru today, that I've ever been in a hospital! Anyway- we went on down and joined Moore's again- September 24 in Pearsall, Texas. We played eight spots, closing the end of December. This year- 1971- was the only year that I was ever out 52 weeks- the full year. We played 38 towns. Show- business- wise, this wasn't a very exciting year, but we sure did put the mileage on: playing all the way from Mexico to Canada! And personally, of course, it was a very big year for Sue and myself, what with the birth of Connie Sue! 1972 wasn't much different than 1971! We opened Jan. 10 with Moore's Greater Shows in Donna, Texas, and only grossed $188 for two weeks! Then we went into Mission, Texas for a week and made $179 with the two shows: baby and animal! We weren't making a living at this rate, so I got ahold of my old friend Gary Hearn, who lived nearby in Alamo, and we booked the 10-in-1 sideshow at the Brownsville, Texas celebration. (We were still always carrying the sideshow equipment with us.) We had a good run there and recouped all our losses! Gary did the magic and lectured; Sue and I did all the other acts and worked the front- it was only just the three of us, but we were all old hands at it, and it was a very good show. Gary was getting a 5-in-1 of his own ready to go up country with, so he didn't work with us after this spot. Sue and I played the next 5 spots with Lucky McDaniel's Show, with our 2 grind shows. Then we played 3 more blanks with Moore's, and made up our minds to get the heck out of south Texas! May 6 we opened with Farrow's Amusement in Memphis, Tenn. We played 3 more with them: Pine Bluff, AR; Greenwood and Greenville, Miss., we then went up to Kennet, Missouri, and played 10 spots with Miller's shows. We were unable to get any help during those 10 weeks, not even any up- and- down help! We left Miller's, and joined Razorback Shows Aug. 14 in Mammoth Springs, AR. We got lucky about help and were able to hire a young man; Si Rash, who stayed with us the rest of the season. Now that we had help, we were able to set up a Snake Show, and combined the animals and baby in one tent. I framed our snake show similar to one I had seen years ago while working on Foley and Burke- that show had been run by a very well- known showman: Red White, and his wife Barbara. Our snake show was set up in a 15'x20' tent, with 3 banners on a 35' banner line. The tent was open in front, with a 4 1/2' high pit. Sue sat inside the pit and the people would go around and look at her in the pit, facing the front. Most people are fascinated seeing a girl hugging and kissing snakes. We'd usually have a big 12'to 15' snake in a box cage, and Sue would have a 6'to 8' snake around her neck. We used Pythons and Boas. When the tip got too big, she'd roust them out by lunging at them with the snake! They'd all run out, and about half of them would buy another ticket and go right back in!!! The tickets then were 25 cents. In the south this Snake Show was always the best show for us, and brought in the most money. The only problem: it took both of us to operate it- I'd be in the ticket box pitching it, and Sue would be inside with the snakes. My baby and animal shows just took a ticket seller, and Si did that. Later when I had a big animal show, I had to have an attendant inside with the animals, who also made change for the feed machines (that came in later years). We played 4 fairs with Razorback Shows; then Fort Smith with Jack Thompson Shows, and stayed with them for 4 good fairs in Louisiana. We closed the season Oct. 29 in Covington, Louisiana. I paid Si off with a bonus, and we went back to Donna,Texas for the winter. In April of this year I had bought four 8'x10' freak animal banners from O'Henry painted by Johnston for $330 total! One banner costs that much nowadays... In June I bought a new 16'x32' Anchor tent and sidewall for $855. Sounds like another bargain! The following three years (1973 thru 1975) were profitable years: we were "hopscotchers". We played on 28 carnivals in 128 weeks! Playing 100 towns in 17 states. Two state fairs: Sedalia, Missouri; and Oklahoma City, Oklahoma. At the end of 1973 I paid cash for a 1974 motor home; and in September I bought some new tent sections for the tent we already had to make it bigger. This made the tent 16'x75'. And we now had a 90' banner line. We got a few more animals, and at the Oklahoma State Fair we bought a new larger horse trailer for our animals. A lot of the carnivals we played were just to fill in till there was an opening on better show routes. We got run off of one show because our Elephant-Skinned Dog bit a kid who was trying to sneak in under the back of a tent. The kid was more scared than bit, but the show owner ran us anyway! 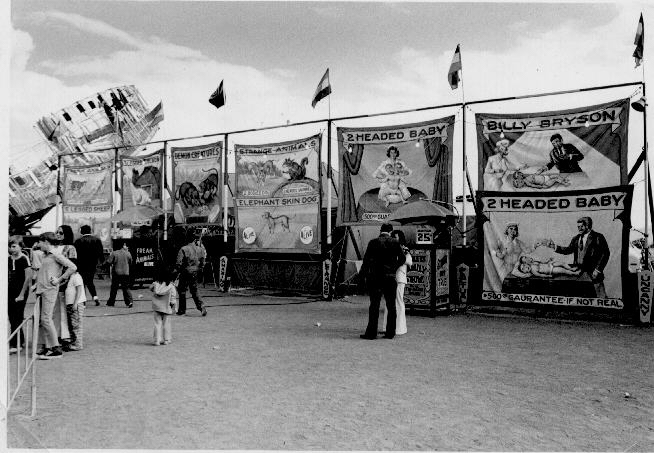 We also got run off another show in 1975 because the owners didn't want our now 4 year old daughter on the midway! This owner was a real P*#&%!!! And this was an Arizona show! I have written in my books for some of the dates,"Don't play here again! ", or'"Don't book on this show again!". And some of the shows were "racket shows" which we didn't want to stay around! I remember playing a spot in Louisiana where the show owner booked our show, and when we got there he had also booked another baby, and another freak animal show! However he put us on the right side of the midway (the best side), and we out-grossed the other animal show by far! The thing I was put out about was that a guy brought on the midway a LIVE 6- legged dog, and he just gave it to the owner of the other show, as he happened to come to it first! 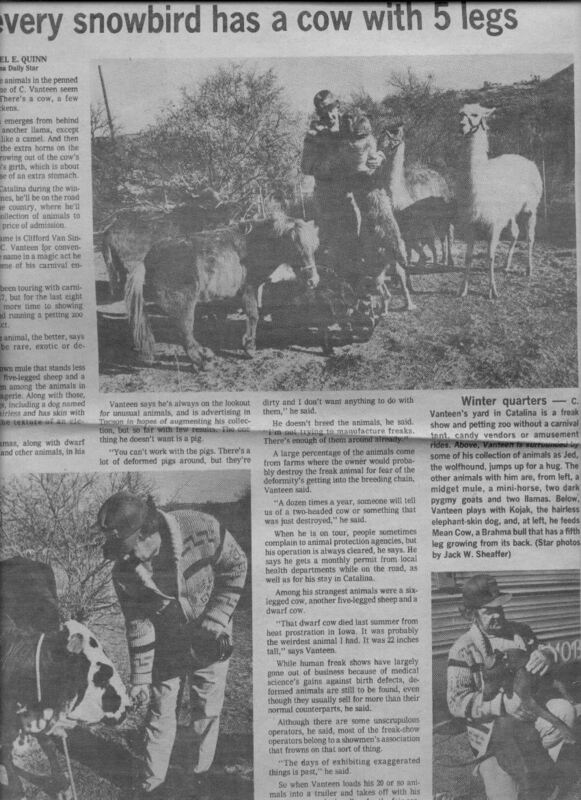 A this time we had a 5-legged cow; 2 llamas (one was a freak); several pygmy goats; 2 elephant-skinned dogs; several freak and unusual chickens; a 32" (that's INCH) horse; giant dog; 2 BIG snakes; a 5-legged sheep; dwarf cow, and a 33" miniature mule! We'll be back soon with stories from later years on bigger shows - and my last 10-in-1!